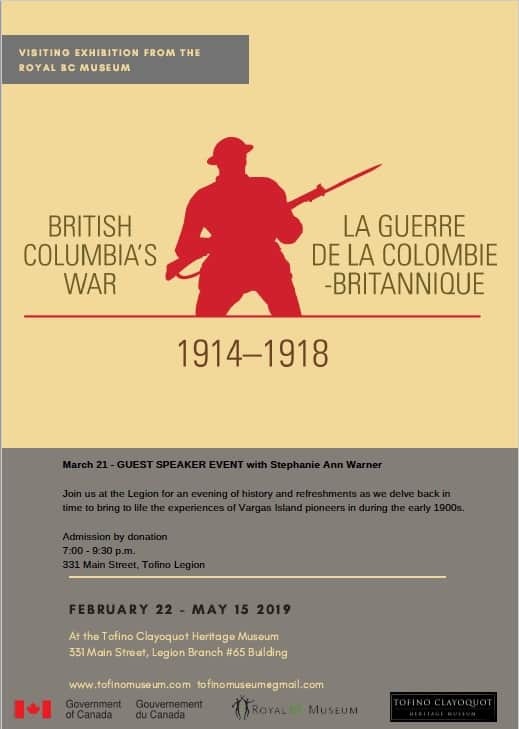 The Great British Columbia War of 1914 – 1918 comes to the Tofino Clayoquot Heritage Museum, with the participation of the Government of Canada. A coinciding exhibition by Stephanie Ann Warner (niece of late Tofino local Harold Monks Jr) covers topics related to wartime Clayoquot Sound in Vargas Island ranchers at home and at war. Hours: Weekly Thursday till Sunday 12:30-4:30 p.m.